Sliding frameless shower enclosures, sometimes referred to as frameless bypass shower enclosures, are considered some of the most technologically advanced showers in the shower industry. While recent years have seen an increase in the amount of less expensive models, these are still considered specialized and high end showers. Their use is becoming more common every year. 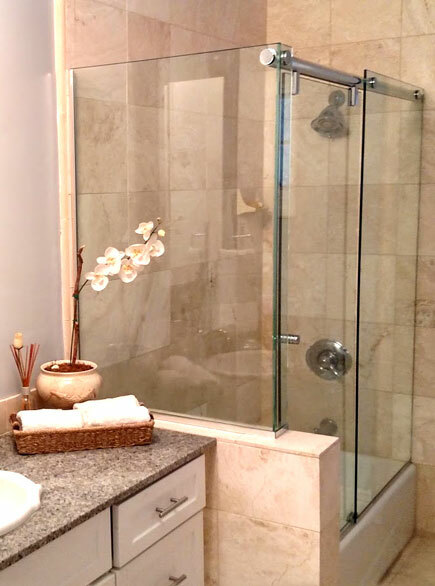 Made of the same heavy ⅜” or ½” tempered glass that traditional swinging door frameless shower enclosures are made of, many of these units use a heavy duty stainless steel or aluminum bar across the top and a minimal bottom track to achieve the look of almost unsupported glass panels. While they can be put above a fiberglass tub enclosure they often are being installed above bathtubs that are tiled around all sides, creating an extremely high end and sophisticated look. Since we partner with a number of different shower hardware suppliers we believe that we have found some of the most competitive options to sell and install these units in the industry. Call us today to see if we can help bring your project in on budget!